Xiaomi Redmi Note 5 Pro was recently launched in India in the mid-range segment with dual camera setup and 18:9 aspect ratio display. The smartphone comes with all the features you expect in a smartphone camera except for one thing, 4K UHD recording. The smartphone is capable of recording 4K UHD videos but Xiaomi has disabled this feature in the system. 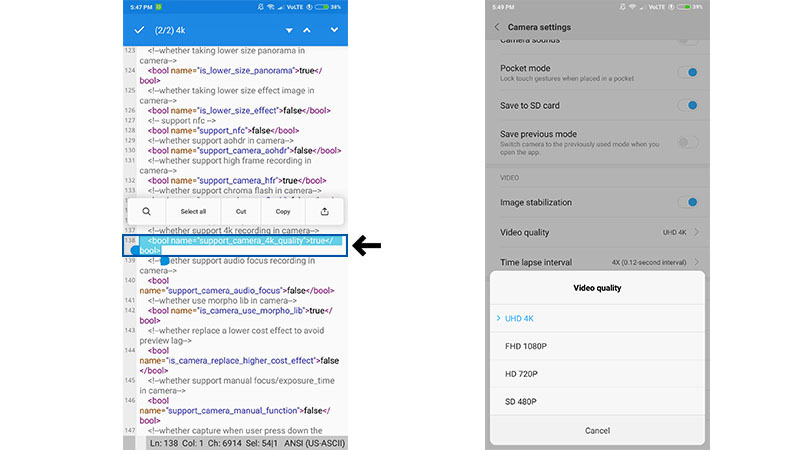 Thanks to Vidhanth for posting this guide on XDA Developers which shows us how you can enable 4K UHD video recording on the Xiaomi Redmi Note 5 Pro. To enable this feature you need your Xiaomi Redmi Note 5 to be updated to the latest version of MIUI available and then root the device. You also need to download an app to edit xml files which you will find free on the Google Play Store. First, you need to launch a file manager and navigate to /system/etc/device_features/whyred.xml. Open the “whyred.xml” file using any text editor app. Find the line says “support_camera_4k_quality” in the file. Now, change the word “false” in the line with “true” and save the file. Reboot your phone to take effect. There you go, once your phone reboots you can go to camera app to check if it works. Now, you can record 4K UHD videos on your Redmi Note 5 Pro. This feature was tested working perfectly on the MIUI 8.4.3 global beta ROM based on Oreo but this will work on other MIUI versions too, you can test for yourself and tell us if it works for you.